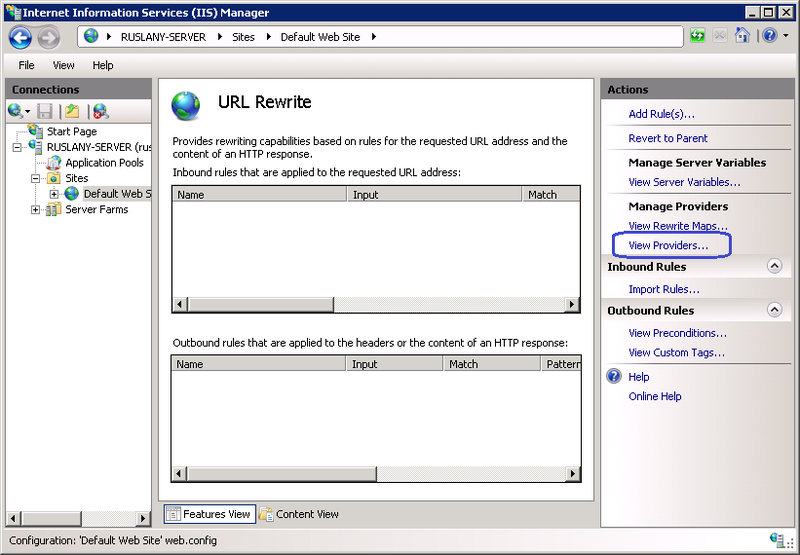 This walkthrough will guide you through how to use custom rewrite providers with URL Rewrite Module 2.0. 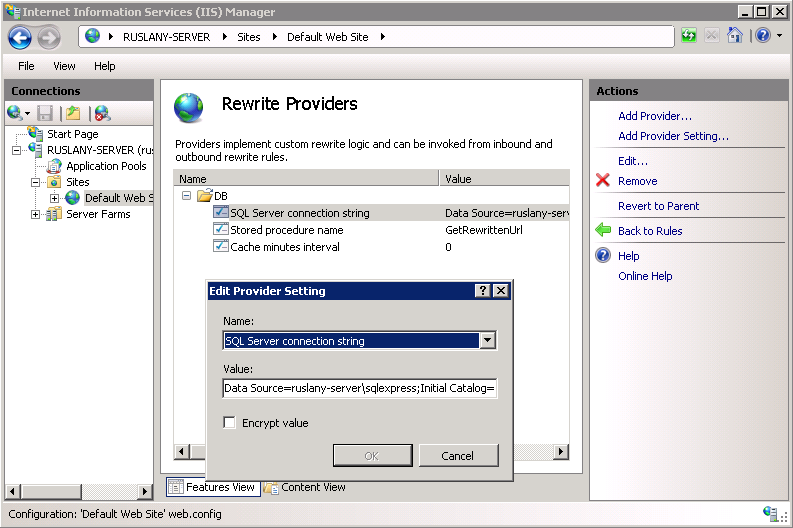 The walkthrough uses the URL Rewrite 2.0 Extensibility Samples, which can be downloaded from URL Rewrite Extensibility Samples at MSDN Code Gallery. Storing of the lookup substrings in a text file. During the installation make sure to select the "Runtime" option in the custom setup. 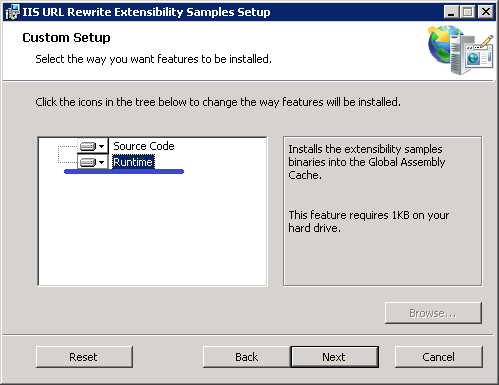 This will register the sample providers in .NET Global Assembly Cache so that they can be used by URL Rewrite Module. FileContainsProvider - this provider can be used to check if any string in a text file is a substring of the provider's input string. 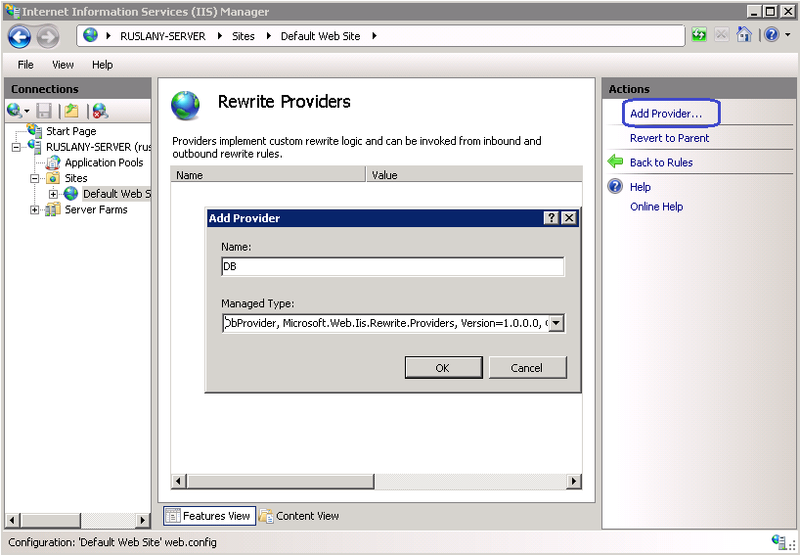 In the "Add Provider" dialog, enter the name that you want to use for this provider when referring to it from a rewrite rule. After that choose the corresponding .NET type for the provider in the "Managed Type" drop down list. Note that it may take some time for the provider types to appear there. Repeat the above steps to register all three providers. To use DbProvider you will need access to Microsoft SQL Server. The provider connects to a SQL Server database and executes a stored procedure that takes a NVARCHAR input parameter containing the input URL string and returns a one row, one column result set containing the output URL string of NVARCHAR type. The above script creates a new database called RewriteDB, which has a table RewriteTable and a stored procedure GetRewrittenURL. It also grants permissions to IIS APPPOOL\DefaultAppPool account to execute that stored procedure. Also it fills up the database table with two URL mappings. In IIS Manager in the URL Rewrite feature view select "View Providers..." int the action pane. Select the DbProvider instance called DB and click "Add Provider Setting..." action. Cache minutes interval: set to 0 if values in the SQL table do not change, or set to a positive integer so that provider periodically refreshes the module's internal rewrite cache. If not specified the value of 0 is assumed. In the root directory of a web site open web.config file. If you use IIS Default Web Site, then the file should be located in C:\inetpub\wwwroot\ folder. This rule performs HTTP redirect to a URL that is obtained from a SQL Server database via DbProvider. The DbProvider instance named "DB" is invoked from the rule's condition and if the result returned from the provider is not empty then the HTTP redirection is performed. To test the rule open a web browser and make a request to http://localhost/old/catalog/product.html or http://localhost/old/contactus/index.html. Notice that the browser gets redirected to a new URL based on the redirect mappings defined in the RewriteDB database table. The web server will return HTTP 404 error for the redirected URL because there is no such file or directory on the server, but that is not relevant for the purposes of this walkthrough. The important part is that the web server issued a redirect response based on the rule that used the DbProvider. FileMapProvider reads the URL mappings from a text file. It can be used instead of the built-in rewrite maps functionality when the amount of rewrite map entries is very large and it is not practical to keep them in a web.config file. WARNING: Always make sure that the text file is not directly accessible from the Web. Use IIS Request Filtering module or place the file inside of App_Data folder to prevent HTTP clients from directly accessing the content of this file. This rule performs HTTP redirect to a URL that is obtained from a text file via FileMapProvider. The FileMapProvider instance named "FileMap" is invoked from the rule's condition and if the result returned from the provider is not empty then the HTTP redirection is performed. To test the rule open a web browser and make a request to http://localhost/old/catalog/product.html or http://localhost/old/contactus/index.html. Notice that the browser gets redirected to a new URL based on the redirect mappings defined in the redirectmappings.txt file. The web server will return HTTP 404 error for the redirected URL because there is no such file or directory on the server, but that is not relevant for the purposes of this walkthrough. The important part is that the web server issued a redirect response based on the rule that used the FileMapProviders. FileContainsProvider reads the set of strings from a text file and then checks if the provider's input string contains any of those strings as a substring. The provider can be used for example with rewrite rules that block access based on user-agent header. This rule aborts the HTTP connection if the user agent of the HTTP request matches any of the strings listed in disalloweduseragents.txt file. The FileContainsProvider instance named "FileContains" is invoked from the rule's condition and if the result returned from the provider is not empty then the HTTP connection is aborted. From WFetch make a request to http://localhost/test/. You should see that the connection gets aborted because the user agent string has matched one of the strings in disalloweduseragents.txt file.